Standard Keyboard Layout for Arcado-Cypriot Linear C. This is the only place you can find it! 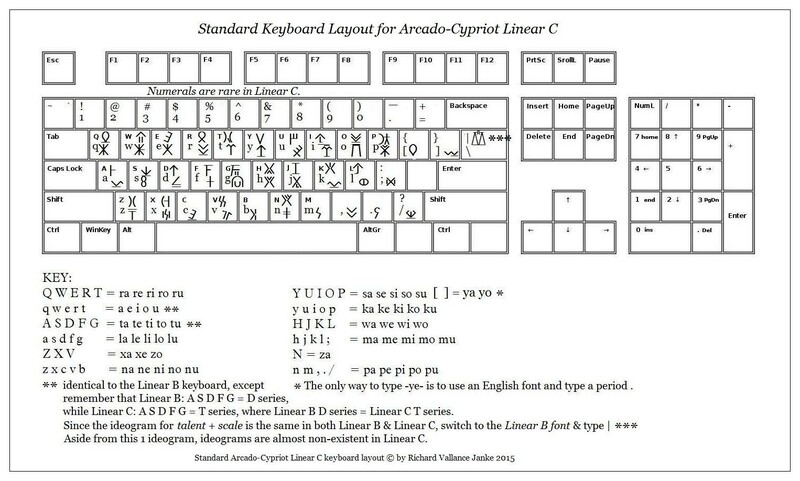 The standard keyboard layout for Arcado-Cypriot Linear C is quite unlike that for Mycenaean Linear B, with very few exceptions. The only key maps which correspond are those for the vowels, a e i o u, which you type with q w e r t in both fonts + da de di do du in Linear B, which is identical ta te ti to tu in Linear C, since the latter has no D series syllabograms, substituting the T series. Linear C also lacks any means to type numbers, but since the Linear B numbering system is almost the same as the Linear C one, you can switch to the Linear B font to type numbers in Linear C, with the proviso that you watch out for any differences in the numeric systems (there are some). But since numbers are rarely used in Linear C, it is not really much of a problem. Arcado-Cypriot Linear C abandoned all logograms & ideograms, of which Mycenaean Linear B has an abundance (over 100), with the sole exception of the ideogram for talent or scale, which is the same in both syllabaries. But since there is no way to type this ideogram with the Linear C font, once again, you will have to switch to the Linear B font and type |. The only other real problem with the Linear C font is that there is no way to type the syllabogram for ye, unless you first switch to an English font and type a period . These are minor inconveniences, which I am sure you will get used to... I did. and then install it in your Fonts before you can use it. Remember to switch to the font called Cypriot before typing in Linear C. You will also need to switch back and forth from Linear C to Linear B to your English font as required. This keyboard layout is the only one you will find anywhere on the Internet. If you are going to use this keyboard layout, you can laminate it with clear mactac, and hang it above your computer. Will I need this one as well as the Linear B keyboard Richard ?